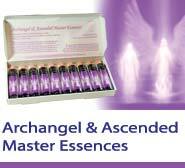 Our Archangel & Ascended Master Essences are a powerful set of Essences helping you to connect to the energies of the Archangels & Ascended Masters. Like doorways into a higher dimension these Essences will help you to link more easily with the web of light and higher consciousness of the Spiritual Hierarchy. The these ten lovely Essences are each vibrationally attuned to the consciousness of a particular Archangel or Ascended Master. You can use them to help you connect with their energies and as a point of focus to ask for inspiration, help and guidance to unfold your own spiritual journey.